The importance of appropriate child restraints in cars cannot be overstated. 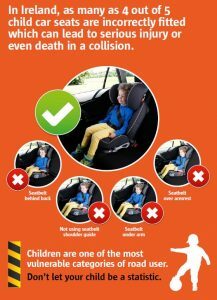 According to the Road Safety Authority, 262 children died on Irish roads between 1996 and 2012 and in almost one third of those cases no child restraints or safety belts were used. A fixed charge notice or court summons for failing to use a child restraint is often seen as a minor matter, but a disqualification from driving can be imposed for failure to use child restraints. Adults must wear safety belts and drivers are responsible for ensuring that anyone under 17 in the car wears a safety belt. Children must be restrained by “an appropriate child restraint system”. In this context, a child is someone who is under 150 centimetres tall (around 4’11”) and less than 36 kilograms (around 5 st 9 lbs). Age is not the determining factor, but there are different obligations for children under 3. The appropriate system is the one from the five “mass groups” (0, 0+, 1, 2 and 3) depending on the height and weight of the child. Airbags must be deactivated if they are in front of a rear-facing child restraint system. This type of car seat usually used for babies and small infants (Groups 0, 0+ or 1). On the basis of these height and weight thresholds, child restraint systems will generally be required for children up to the age of around 12. It is important to note, however, that the rules do not mention age. The type of child restraint system to be used must meet standards set down in EU and UN regulations and product labels will indicate compliance by displaying an ‘E’ mark (an E and number in a circle). In the back seat of a passenger car (up to 8 passengers) where there are two child restraint systems fitted and a third cannot be fitted a child over 3 can sit on the seat so long as they wear a safety belt. There are very limited exemptions from these rules, the main one being medical reasons. However, to rely on the exemption it is necessary to have a specific form of certificate from a registered medical practitioner. On payment of a fixed charge notice the fine for an offence is €60 and 3 penalty points. A court conviction carries a fine of up to €2,000.00 and 5 penalty points. However, the courts have the power to disqualify drivers from driving in addition to specific fines and penalty points. In recent years there have been a number of cases around the country where parents have been disqualified from driving for failure to restrain children while driving. The RSA has published a very useful guide on child restraints available here. Their recommendations go further than the legal requirements in many areas but are prudent and well worth considering. For example, while booster cushions for children over 3 may be legal, the RSA recommends that they not be used for children under 22 kgs/48 lbs (around 6 years old on average) and, because booster cushions provide no back or head protection, high-backed booster seats are recommended for use as long as possible (up to 36 kgs/79 lbs, around 11 years of age on average). Similarly, while children can sit in the front passenger seat of a car (subject to complying with the ban on using an air bag with a rear-facing child restraint system), the RSA recommends that children be seated and restrained in the back seat (in a vehicle which does not have safety belts children must be seated in the back). For any motorists carrying children, it is worth carefully reading the RSA guide for detailed and helpful guidance about the types of restraints that must and should be used and how they should be fitted and operated.